The original club house of the Allotment Owners Association was built by the Kersko Allotment Owners as a group project and became their private club house. 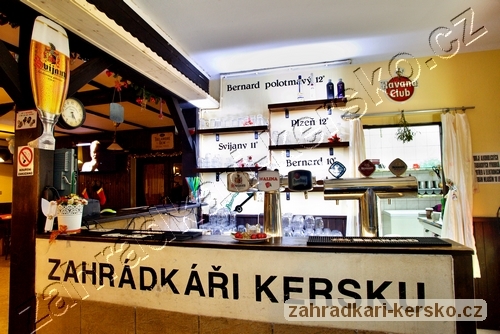 When you enter the building you will be welcomed by the text “ZAHRÁDKÁŘI KERSKU” (Allotment Owners for Kersko) , which is inherent to the club house and is also well-justified here. Today the building houses a restaurant offering Czech cuisine and naturally the Kersko speciality – rosehip sauce. This was made famous in the film Snowdrop Festival based on the book by Bohumila Hrabala, who had been a member of the Allotment Owners Association since 1965. Our garden has a small play corner and is situated right next to a sports grounds a sufficient distance away from the road, which is particularly appreciated by families with children. You can find the Saint Josef Spring familiarly called “Kerka”, right next to the restaurant, as well as tennis courts and a tree planted by Bohumil Hrabal. The location of the restaurant is often used as a starting point for setting out along the network of hiking and cycle paths throughout the area surrounding the Elbe River. The origins of the Kersko spa town in the forest date back to the beginnings of the twentieth century and it boasts many sites of interest today, including the Bohumil Hrabal educational trail, the Menhir and the Celtic Burial Grounds. we do not smoke inside. You can smoke outside in our garden, where we will be happy to serve you.